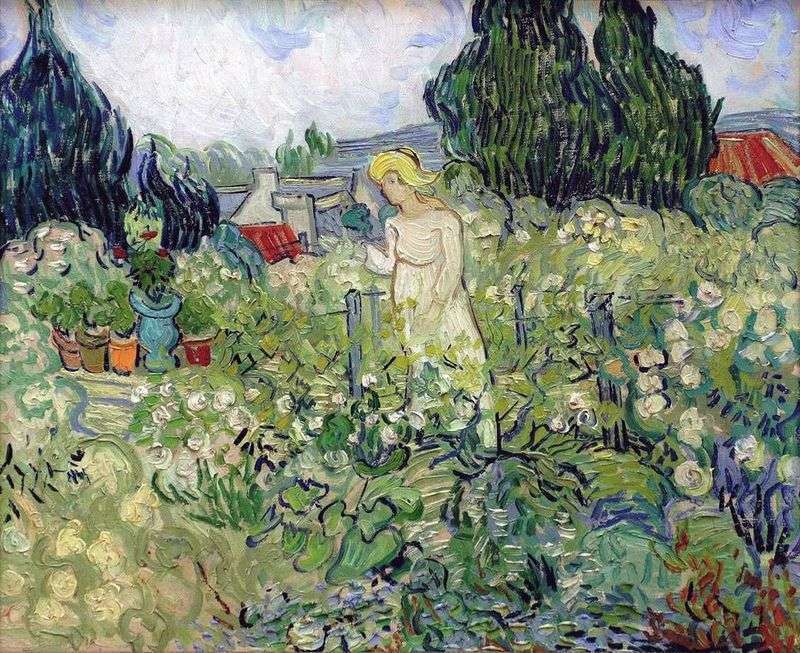 The painting “Margaret Gachet in the Garden” Van Gogh wrote in 1890 in Auvers. On it, he portrayed the daughter of his friend Dr. Gachet, who was fond of art and was familiar with many artists. In the house of Gachet, Van Gogh was a frequent visitor; during his stay in the Auvers he created two portraits of the doctor himself and several works depicting his daughter. Margaret Gachet spent her whole life in her father’s house. In this picture, Van Gogh depicted it in his garden, among thick bushes and flowers. The painting is characterized by a pastel color scheme and a balanced composition. The girl stands in the middle of the garden, gazing calmly at the branch in her hand. The white color of her dress – a symbol of purity – echoes with speckles of white flowers, with which the overgrown garden is strewn. Coloring the picture is based on a combination of light tints of green and blue shades. Only a few color accents stand out against the general background: red roofs, tubs with flowers and yellow hair of Margarita. Dark trees on the left and in the background pictures restrict space, creating a feeling of coziness. The picture is filled with a mood of peace and tranquility. Performed in a flat format, large flooded areas, it is close in style to Japanese painting. At the same time, it easily recognizes the artistic handwriting of Van Gogh, in the Over-period was characterized by uneven lines and smears. This work Van Gogh gave Dr. Gachet. Description and meaning of the painting Margaret Gachet in the Garden by Vincent Van Gogh.